As we waddled out of the harbour laden with copious fruits and vegetables donated to us by the local school we were met with fabulous east north east winds, trade wind clouds and a gentle sea. Now this is the pacific. We couldn’t have asked for better conditions. We headed north up the east side of the island before turning to the north east. On our way along the east coast we met up with Maria and Mark onboard their yacht Graziella were sailing back from Okat Harbour. 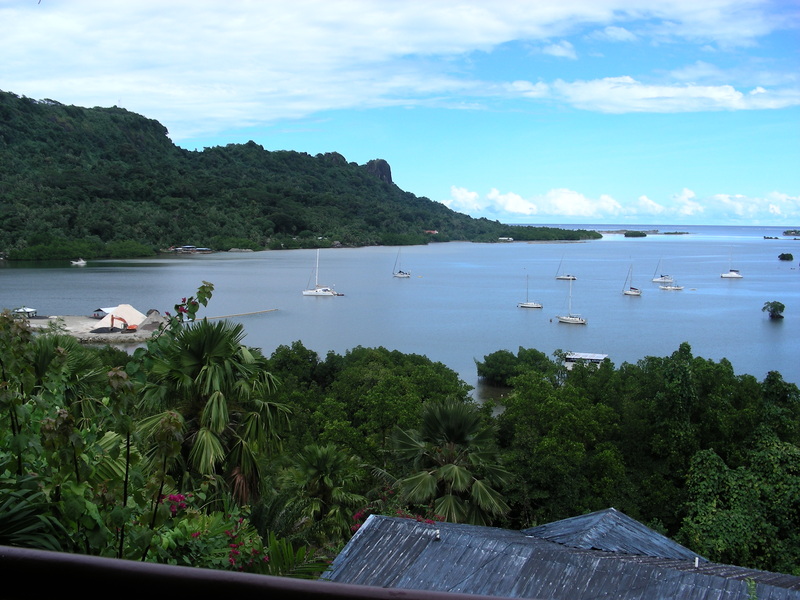 They had done a circumnavigation of Kosrae as a break from their day to day work at the Pacific Treelodge Resort. We took photos of each other, waved goodbye and were on our way. The winds continued at 10 – 12 knots from an east north east direction and in the first 24 hours we covered 140 miles and roared passed an atoll called Pingelap. Within a few hours the wind became finicky but enough to keep sailing with a few hours of motoring thrown in when it was completely calm. It didn’t take long then for the new reality to set in. Within about 12 hours the skies were overcast and the world a different place. However for the next 2 and ½ days we plugged on through rain squalls, calms, strong winds and generally unlikeable conditions. 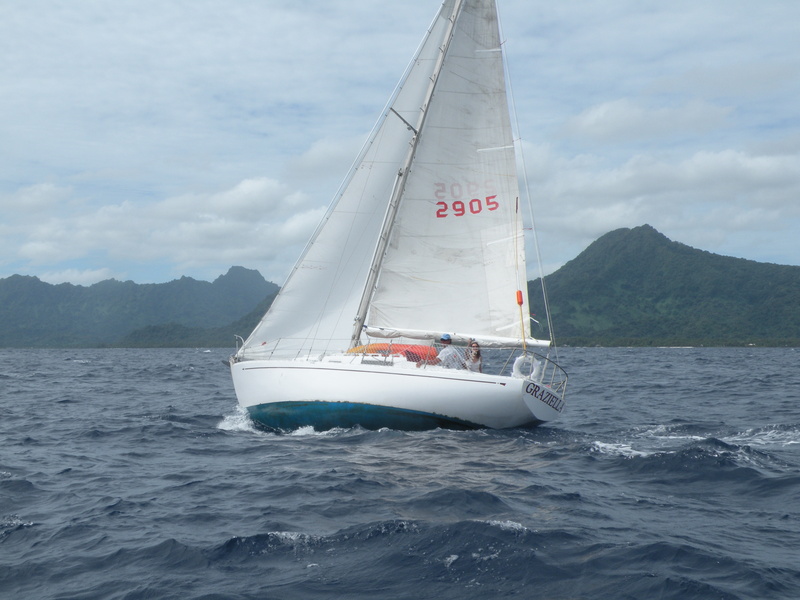 Persistence paid off and eventually we found ourselves approaching Pohnpei. However, it was late in the afternoon and not knowing the entrance through the coral we decided it best to heave to (that is stop) for the night and wait till the morning to enter. 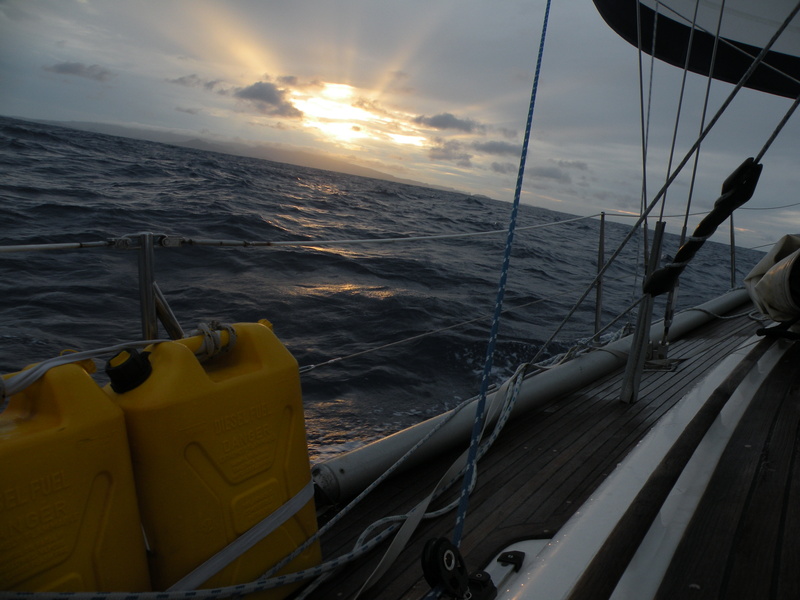 We spent the night quietly but rather uncomfortably due to the seas, wind and rain. Squalls were frequent with blinding rain but with one person below and the other in the shelter of the canvas in the cockpit we made out OK. 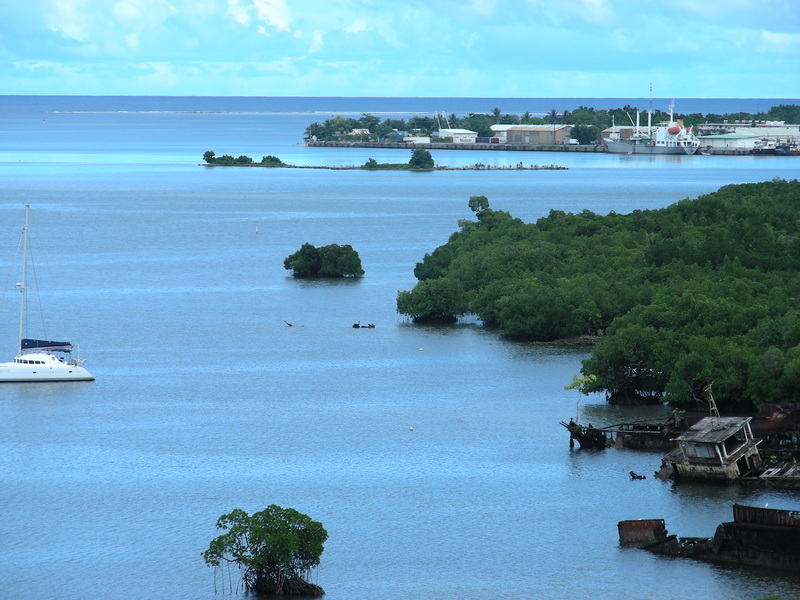 So, here we were having left Korsae on a Thursday and arrived off the coast of Pohnpei on Saturday evening. Not a bad run of a total of 360 miles. By 0500hrs we started to move in towards the island and by 1000hrs we were approaching the main entranceway. But then another major squall hit us when we were 500 metres from the main pass. Blinded by the rain and wind all we could do was go back and forth along a straight line until the squall passed and we had better visibility. The pass was amazing and I now understand why the surfers call this paradise. The break was amazing. Huge rollers were coming in producing enormous breaking waves on either side of the pass, truly an amazing sights. We got through in the section that doesn’t break and then were confronted with poor navigational aids to help us through the coral patches and down towards the main harbour. At one point we obviously strayed off course and touched coral but were lucky to avoid anything major. We made it to the commercial port and for some strange reason, since we’re in the same country as Korsae, had to clear customs, immigration, port authorities and agriculture. Each and every one wanting between 10 and 30 dollars. What a pain. The next part was to find a safe anchorage where we may find a few other yachts. We could see in the distance where they were anchored. Connie made some enquiries about how to get there as it wasn’t obvious and the channel wasn’t marked. No-one seemed to know. So off we went to feel our way down the channel. However, the water is cloudy due to run off from the mountains so it’s not exactly tropical clear water. On our way down we went aground. Quickly placing the engine in reverse we managed to pull ourselves off and hopefully no damage but can’t check until we get clear water. We then anchored in the channel and eventually waved someone over to ask how to proceed. He kindly led us through in his dinghy to the place to anchor. Obvious when you know how. So, we’re here. However, there is only one other cruising boat here. There are no facilities ashore for yachts to bring their dinghies and no services other than in the town. On top of that one is quite a way from town via a very steep hill that in this climate makes it doubly difficult. Anyway, we’re thankful to be in and we have made some shore contact with a family who has kindly allowed us to bring the dinghy ashore to their home. We’ve been in for a few days now and as usual have managed to orient ourselves to the landscape, done some shopping and the laundry, bought a new battery to start the engine, replaced the float switch on the bilge pump, mailed some postcards, had lunch out and met a few people at the Rusty Anchor which sits on the hill above the anchorage and has some of the most delicious wood fired pizzas! That green flash results from flying cows in the upper atmosphere. Where to next? The best pizza story I have ever heard. 5000 miles to dine on a hill over looking murkie water. Are you going to go surfing?